Gunstar Heroes, one of Treasure’s most revered games, is often lauded for its graphics and astonishingly great gameplay. The first time I ever played the game was in 1993 – Anime Inferno co-founder Inferno and I wheeled our bikes around to our local independent rental haunt, Power Play, and lo-and-behold, there was Gunstar Heroes in all its well-loved glory. I ended up buying the game in 1995 when it went on “sale” at a local K-Mart (games “on sale” in 1995 meant it was $49 instead of $89 – I love retro games but don’t miss the retail prices from the mid-90s), and countless playthroughs developed an endearing love for the game’s mechanics, anime-influenced visuals and the game’s rather excellent soundtrack. It was with excitement and surprise when Data Discs announced that volume 11 of their game music LP series was going to be Gunstar Heroes. 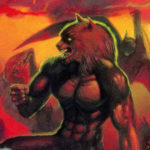 The release simultaneously scratches a few persistent itches – it provides an amazing showcase of the game’s concept and official art, legitimises my fanboy love of the soundtrack and it’s strength as a stand-alone set of compositions, and (most importantly) it presents them with absolute loving care in this beautifully mastered effort. The arrangement of tracks over the four sides feel designed to mirror an average session playing through Gunstar Heroes. It kicks in with the two opening themes, one noting the cut-scene intro before fading into the title track (which by extension rolls into the second opening cut scene). Norio “NON” Hanzawa’s work in this arc of the OST creates some of the synth-heavy framework that we see permeate the whole of the soundtrack, with layers of really well-considered FM synth atop some punchy PCM drums. The next arc covers the first four main stages in sequential order (remember that in the game you can customise the order of levels for this segment) along with their respective boss themes. For this part of the soundtrack my favourite theme continues to be the first level’s which combines some really ambitious melodic arcs that drive the action extremely hard. In this sense the kinetic energy of this level is captured really well in the composition of this track, though this arguably extends to the boss themes (different for each level) which lean more heavily on harsher sounds and fast drum tracks to drive home a sense of panic. This means they work very well in the game, but come off as a little harsher on the ears when considered on their own. The second half of the soundtrack (well, game) pulls in my favourite track of the game, Stage 5, where you’re off to avenge Yellow’s kidnapping and does a beautiful job of swinging in all sorts of uplifiting passages in such a high-energy track. The side-scolling shooter stage is another highlight for the OST as well, bringing in reprises of themes from the opening tracks too. With Treasure’s inevitable boss rush dominating the remainder of the gameplay, tracks fall into a more typical video game mould by providing an excellent accompaniment to the visuals, but can make for challenging listening if you don’t have an attachment to the game. 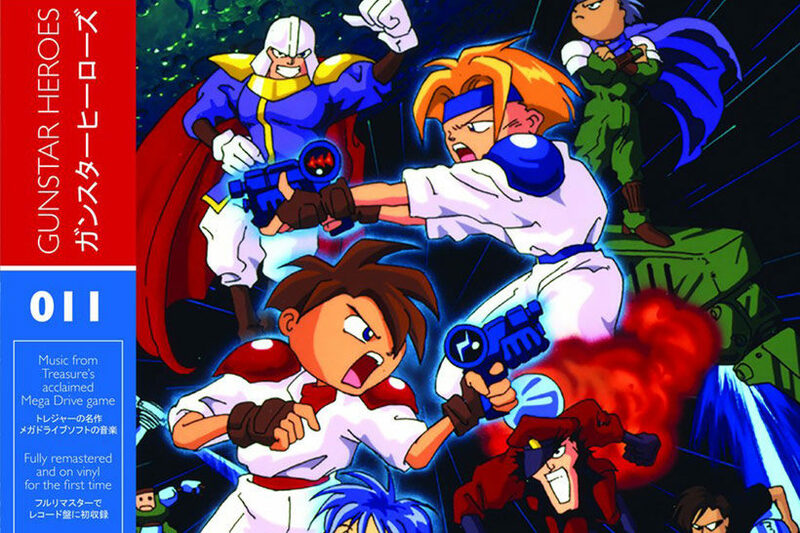 It’s with absolutely fondness that we come to the OST’s finale though – Gunstar Heroes’ ending smacks of typical anime/manga fare from the era, but it was so powerful and moving back in the day that I never ceased to get swept up in the proverbial crescendo for what I affectionately refer to as Green’s Redemption theme, before the hyper-kinetic ending theme kicks in which joyfully reprises many of the individual levels’ themes. The Mega Drive has historically been saddled with a reputation for poor music, but as time has gone on there seems to be a consensus that the console’s audio chipset is capable, but only when applied correctly. This is certainly true for Gunstar Heroes – Hanzawa’s arrangements and synth programming suit the environments and feel of Treasure’s legendary title while simultaneously applying the best of practice synthy goodness for the Mega Drive. Even comparing to some of the arranged soundtracks that have come out over the years, there’s something engaging, warm and organic with lashings of sci-fi that makes Gunstar Heroes’ soundtrack incredibly polished. 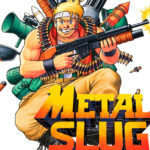 Fans of this release should take the time to listen to some of his other work as there are definitive persistent themes to his style – Guardian Heroes sees him eschewing the Mega Drive’s FM synth for an extremely ambitious and accomplished red book audio-based soundtrack on the Saturn, affectionately reprising some of his themes from Gunstar Heroes in Astro Boy: Omega Factor on the Game Boy Advance before coming full circle with Gunstar Super Heroes also on the Game Boy Advance. Some of the other great touches with this release is how it breaks up the tracks across the two 45 rpm LPs. The continue music loop kicks in at the end of side B which would probably be around the time that most players reasonably new to the game would need to recharge their ailing health meters, and Data Discs’s trademark cheek of throwing in an iconic audio sample on a loop at the end of the individual records is always a nice touch. Just make sure you set your turntable to match the speeds of the 45’s unless you want to unintentionally approximate a session with the PAL version of the game (that was my thought process at least when I accidentally did it!). Also worthy of discussion is the amazing presentation. This release features a slew of stunning concept art from Sega’s and Treasure’s archives which are beautifully reproduced on extremely solid cardboard stock. Each record is housed in individual cardboard sleeves and sandwiched between these is a lovely fold-out poster featuring an extended print of the official Japanese cover art. 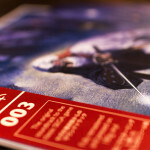 The discs in our review copy were blue and red 180g vinyl, with the colours chosen in honour of the main protagonists. There’s also the obligatory obi which I continue to be fearful of ruining, but it does come off as a great touch of class on Data Discs’ releases. References to the cast (which are all named after colours) even make their way onto the individual record sleeves noted above, with the sleeve for the first record featuring red and blue stripes on either side, while the second has green and yellow. A really nice touch for fans of the game. 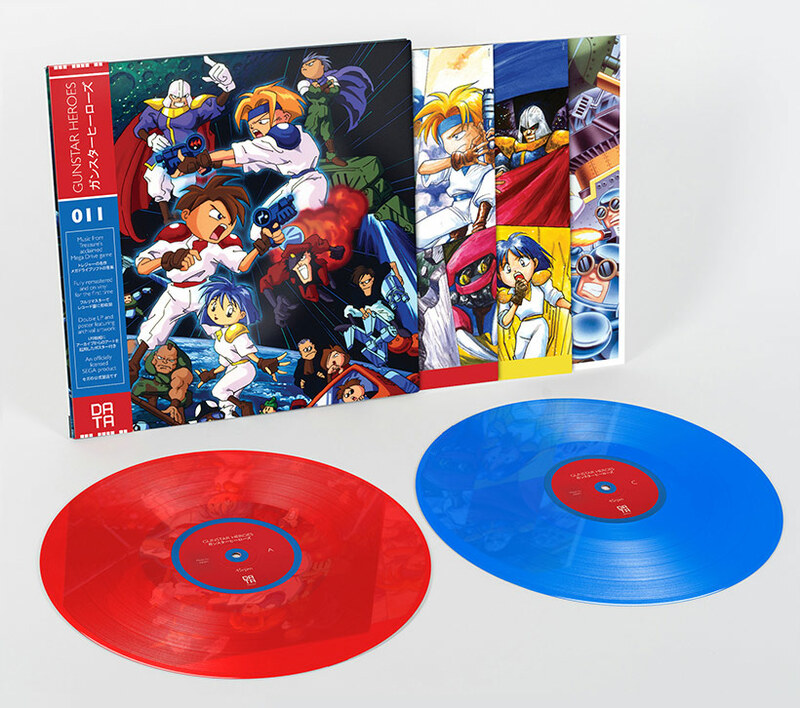 Ultimately, Gunstar Heroes is a cracking game and Data Disc’s release of the soundtrack on vinyl is a stonking tribute to one of the true stars of the 16-bit era. 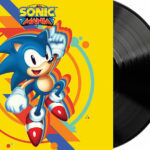 Superb mastering and superlative packaging make this a truly essential purchase for all fans of quality game music, especially for those with a love for vintage Sega console gaming.